Happy Friday, readers! Who’s excited for this week to be over? Me. I am. It’s been a doozy. Spring is making an angsty teenage entrance to New York City, happy and bright one minute, bitter and dark another. Also, my entire office has contracted the plague, so the week has been an exercise in avoiding wayward germs. I was only half successful. Coughs and fevers and stomach bugs, oh my. Ah well, the weekend is upon us. And with the weekend comes a new feature on the blog: the low/mid/high series. A fun adventure in which I find my favorite versions of products at low, mid, and high price points. I am always on the hunt for the best price-value relationship for my purchases, knowing that sometimes the cheap thing works and sometimes you gotta throw down some cash for the quality goods. I’m here to guide you on what’s best, then you can decide what you want to spend. Easy peasy. Today’s feature is all about dry shampoo. Despite my self-proclaimed obsession with beauty products, sometimes I’m lazy. Dry shampoo allows me to be lazy and also still look polished. It’s also great for extending a blowout to day two (or three) or adding a little volume to a hairstyle that might have fallen flat. Whatever your needs, dry shampoo is a great tool to have in your hair arsenal. 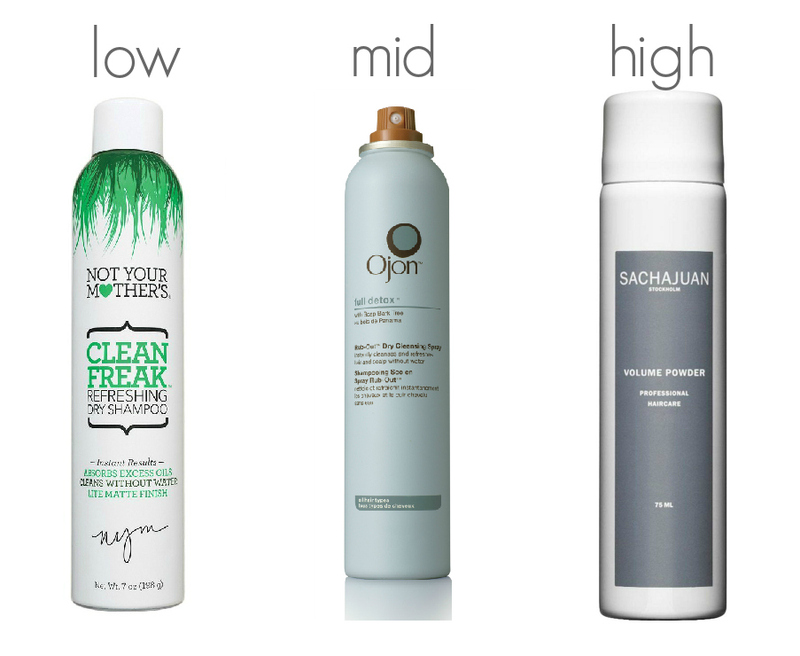 Low: Not Your Mother’s Clean Freak Refreshing Dry Shampoo, $5.99. This was a lucky drugstore find that turned into a major win. It’s great at reducing excess oil in your hair and has a pleasant scent to it, which is somewhat rare for dry shampoos. I find your hair stays fresh all day, although it doesn’t add as much volume as the more expensive versions. The bottle goes by pretty quickly for the size, but for the price, it’s a solid choice. Mid: Ojon Full Detox Rub-Out Dry Cleansing Spray, $13 for travel size, $24 for full size. First of all, let me just say that for such a great product, I cannot stand the name. It’s like 27 words long and uses the phrase ‘rub-out’. I can’t even. Other than that, it’s fantastic. It keeps your hair looking clean and polished all day long and adds great volume from just a few quick sprays. The smell can be a little strong at first, but that fades quickly. I also like that it comes in two size options; I keep the travel size in my desk at work for touch ups and have the full size version at home. High: Sachajuan Volume Powder, $32. This is the Cadillac of dry shampoos, both in terms of features and price. It’s fancy. It’s Swedish. And it is THE BEST dry shampoo I’ve ever used. It usually lasts more than one day, it adds amazing volume and it is the closest thing I’ve found to actually washing your hair. It’s not my every day go-to, mostly due to the price tag, but if I need something with staying power, this is what I reach for. I also sometimes use this as prep for a formal event or a night out. If you want your ‘do to stay fresh all night long (especially if there’s dancing involved), this is a lifesaver. So there you have it. Go forth and purchase. I hope you enjoyed my first low/mid/high series. What other products should I test drive? Let me know in the comments and I’ll add them to the list! makeup monday: my go-to hair tools. 1) infiniti by conair 1 1/4″ ceramic curling iron, $29.99. 2) ojon volume advance thickening spray, $24. 3) l’oreal elnett hairspray, $14.99. 4) fekkai advanced ironless silky straight serum, $25.48. 5) wigo cushion 100% boar bristle brush, $19.99. 6) t3 featherweight 2 hair dryer, $200. OK. So technically, this post is not about makeup. Sorry. Hair falls into the larger category of ‘Beauty’, but ‘Beauty Monday’ just doesn’t sound as good, so here we are. Really glad we covered that. The topic of hair, however, is one that I am just as willing to spend hours discussing, so I thought sharing the secrets to my good hair day would be helpful to you, dear readers. I don’t use these products and tools everyday (I don’t think I’ll ever be one of those girls who looks like she just left the salon every time you see her), but when I want a great bouncy/wavy blowout look, these are my tried and true. A good blow dryer: I’m a big fan of my T3 (and not just because it was the key purchase that launched me into the upper echelons of Sephora’s loyalty program), but there are plenty of other ‘professional grade’ brands out there that will do the trick. The price tag might seem high, but if there’s one place to spend money on your hair, it’s here. I find that this dryer takes less time to dry my hair and I get smoother results. If you’re someone who blow dries their hair every day, this is even more important, as it will do less long term damage to your hair. The T3 also comes in travel size, which if you’re willing to live without a few extra features, achieves the same results for less money. A boar bristle brush: As someone with naturally curly hair, I try not to brush my hair too often, as I find that it creates frizz. When I do brush my hair, however, I reach for the boar bristle brush. Because the boar bristles help to distribute the natural oils in your hair from your scalp through your hair cuticle, it polishes and smoothes the hair to encourage a glossy shine. I also find that it’s a great tool to use to help straighten those little wispy curls around my face. The bristles really grab onto the hair so I can easily get to them with my blow dryer. 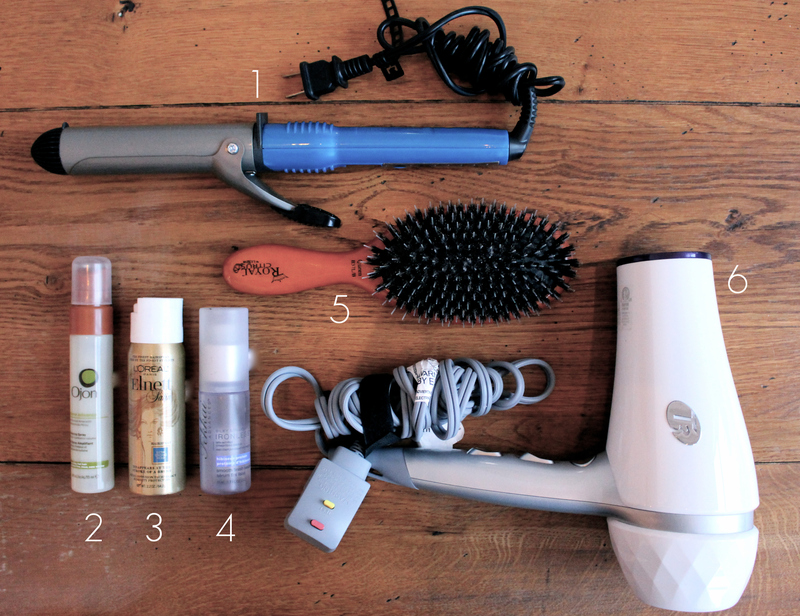 A ceramic curling iron: For me, this is what takes my hair from blah to huzzah. After I blow dry, I curl my hair away from my face in 1 inch sections over my entire head. I let my hair cool, spritz with hairspray, then run my brush through it and it’s good to go. This step helps my ‘do stay all day, and I can usually stretch it to day two (or three) with some dry shampoo and a little re-curl of sections that may have fallen flat. Good quality hair products: When I want a big and bouncy look that will last all day, I rely on three products — volumizing spray, smoothing oil, and hairspray. The volumizing spray, applied to the root of the hair when it’s wet, helps to get good height and bounce as you dry (not, like, Texas beauty queen height, but close enough). The smoothing oil, applied when hair is dry, smoothes (obvi) the hair and helps control flyaways and frizz. This is especially helpful on humid days, aka the entire New York summer. And hairspray, applied at the very end to set the hair, helps keep your style in place all day. If you’re looking for some tips on how to perfect an at-home blow out, check out this video. With these tips and the tools & products above, you’ll have salon quality hair in no time!